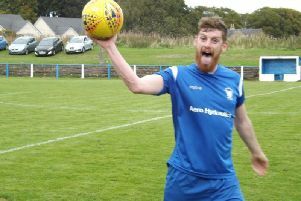 On another sensational weekend of McBookie.com League Two action, Lesmahagow Juniors enjoyed a thumping 5-1 home success over St Anthony’s to keep the pressure on leaders Lanark United at the top, writes Craig Goldthorp. Second placed ’Gow remain eight points behind leaders Lanark United with two games in hand. ’Gow gaffer Robert Irving said: “Fair play to Lanark. They had a depleted squad on Saturday but still ground out a result. “You have to take your hat off to them. “The two Clydesdale clubs are going for promotion. “We are guaranteed promotion if we win at Newmains this Saturday (kick-off 2pm). St Anthony’s took a shock lead before the hosts equalised when Scott Schoneville scored a left foot shot after a Gary Nicholson pass. ’Gow went 2-1 up when John McStay headed in a Schoneville corner. And their lead was increased in the second half when Sandy Thomson netted a penalty awarded for a foul on Jason Thomson in the box. ’Gow then went 4-1 up when Jason Thomson netted a spot kick after he had again been felled. And the scoring was completed when veteran Kris Jarvie scored following a Schoneville cross. Incredibly, Jarvie has now scored five goals in four sub appearances since joining ’Gow after being freed by League Two rivals Forth Wanderers. Speaking of Forth, they are 12th with 25 points from 22 games after losing 3-2 at Johnstone Burgh on Saturday. A superb individual goal from James Van Nuil on 43 minutes put Forth ahead, but Johnstone hit three goals of their own before Ryan Cherrie was sent off for the visitors. Euan Scott pulled one back but it wasn’t enough for Forth who host Ashfield this Saturday. * Carluke Rovers won 8-0 at Ardeer Thistle on Saturday.